We also offer training in your salon. Trainings are specially prepared for those who are willing to become a professional eyelash extension applicator and for professionals willing to increase their level of knowledge, to increase their qualification. We offer high theoretical education and practical trainings. Our trainings are specially formulated, to allow students to get a lasting skill, practical knowledge, and at the end they can apply this skillset with high quality. Professionals during this training will gain a new approach to eyelash applications and tips to increase their work quality. After certification, your name will be listed in our Xtreme Lashes® Cyprus home page. Trainings are held by professional trainer, certified by Xtreme Lashes® USA. Training lasts two days from 09.00 until 18.00. After completion of our training, we will not immediately give out the certificate. All participants after attending trainings should send 5 clients with before and after pictures, within one month. This is needed to ensure that needed skills are developed well. After that Xtreme Lashes® certificate will be issued. Certificates are valid for one year, after which another 5 clients before-and-after pictures must be submitted. If the skills remain at high standsrds, a new certificate will be issued. Before training, an agreement is signed with each one of the participants. After training, it is required that participants purchase the Xtreme Lashes® application products. Methods of Payment: by cash or bank transfer. 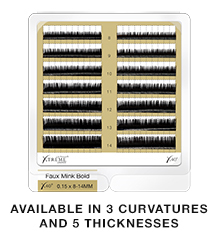 What it is: Volumation is the technique of adding multiple eyelash extensions to one single natural eyelash to create depth, volume, and texture utilizing the Xtreme Lashes Lash Calculator™ to calculate accurate design opportunities. The Lash Calculator™ tool is a proprietary online program used for single and volume eyelash extension applications that helps Lash Stylists determine the ideal lengths, thicknesses and number of eyelash extensions that they can safely apply while preserving the long-term health of the natural eyelashes. The Lash Calculator tool provides recommendations for eyelash extensions applications based on the condition of a consumer’s natural eyelashes. Enroll in a Volumation™ Advanced Training Program to learn how to use this amazing tool! Volumation training will be instructed using the all-new Faux Mink Bold eyelash extensions. This lightweight and flexible, yet super-impact lash was created specifically for dramatic definition and designer applications using the new 0.05mm and 0.07mm thicknesses. How to calculate and apply the ideal level of volume to accommodate those with thin, short and sparse natural eyelashes as well as those with fuller, thicker and longer natural eyelashes. How to isolate, coat, attach, and relash using Volumation. How to properly and safely remove volume eyelash extensions. How to combine other advanced-level techniques (Perking, Feathering, Bridging, and Layering) and corrective techniques with Volumation. How to optimize Faux Mink Bold Eyelash Extensions for Volumation and single, 1-to-1 application. How to perform and educate clients on essential maintenance: cleansing, grooming, etc. How to retail specially formulated Xtreme Lashes cosmetic products. Gain more clients with an elevated design skill that can dramatically transform sparse, short, and thin lash lines versus single, 1-to-1 application. Get recognized! Receive the designation, "Advanced Certified in Volumation™," added to your Directory listing to advertise your specialized skill. Trainings are specially prepared for those who are willing to become a professional eyelash extension applicator and for professionals willing to increase their level of knowledge, to increase their qualification. We offer high theoretical education and practical trainings. Our trainings are specially formulated, that allow students to get a lasting skill, practical knowledge, and at the end they can apply this skillset with high quality. Professionals during this training will gain a new approach to eyelash applications and tips to increase their work quality. After certification, your name will be listed in our Xtreme Lashes® Cyprus home page. Trainings are held by our professional trainer, certified by Xtreme Lashes® USA. Training lasts two days from 09.00 til 18.00. After completion of our training, certificates are not issued immediately. All participants, after attending training, must submit 5 before-and-after pictures of clients, within one month. This is necessary to ensure that the needed skills are applied correctly. After the 5 photo submission the Xtreme Lashes® certificate will be issued. Certificates are valid for one year, after which another 5 clients before-and-after pictures must be submitted. If the skills remain at high standsrds, a new certificate will be issued. Before training, an agreement is signed with each one of the participants. After training, it is required that participants purchase the Xtreme Lashes® application products. Payments must be completed by cash or bank transfer.